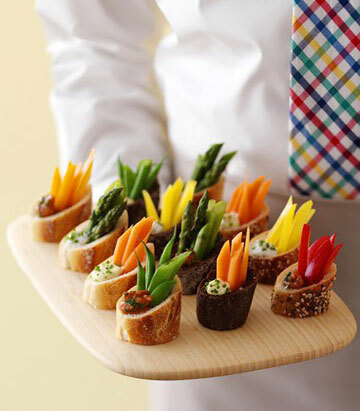 I am always looking for interesting ways to serve or present food... it's little details like these that make parties look fabulous. Here's a few great ideas I've run across, I can't wait to try them! A thick slice of baguette, with a little well hollowed out on the diagonal side. Fill with fresh veggies and a dollop of dip. 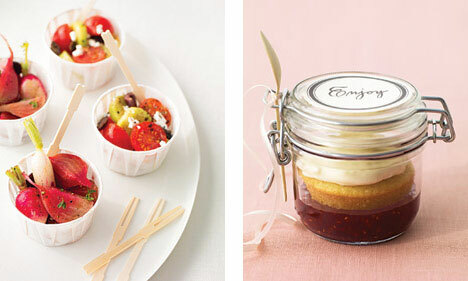 A fresh salad becomes a cool hors d'oeuvre presented in a paper cup with a mini wooden fork. What an adorable way to serve milk at a child's party! Dip the rim of a glass in water, then dip the rim into a dish of sprinkles, turning gently to coat. 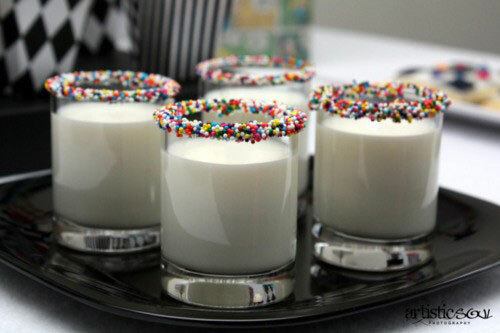 When filling the decorated glasses with milk, use a funnel to avoid disturbing the sprinkles. These darling dessert cups are a grown-up take on the popular "dirt" kid's cake. Glass votives are filled with chocolate pudding, then topped with crushed chocolate wafers. 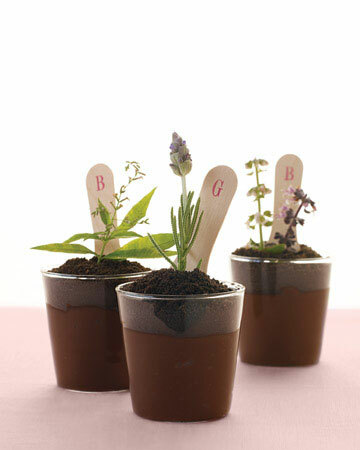 Tuck in a lavender bloom or lemon verbena, and serve with a wooden spoon (doubles as a plant marker). Mini food is so adorable! 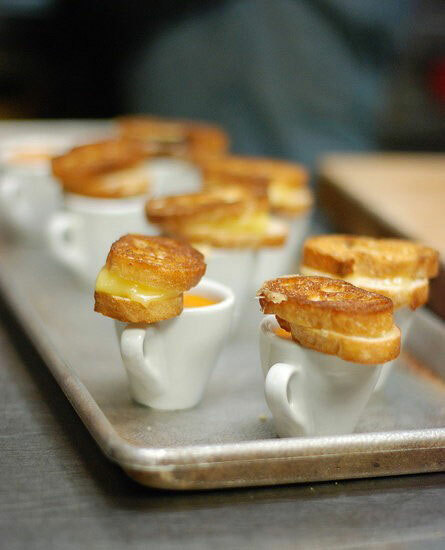 These baby grilled cheese sandwiches are made with baguette slices, and served atop a steaming espresso cup filled with tomato soup. Edible chocolate cups can be used to serve ice cream, pudding, sorbet, or cold fruit soups. See Bakerella's post for the full instructions. The sprinkles on the milk glass are so cute. I bet you could do that with ice cream too. I ripped that edible plants dessert out of Martha's magazine this month. Very clever. Ooooh, sprinkles on bowls would be so cute for ice cream! Great idea! I haven't been able to find nonpareils, such as the ones shown on the milk glasses, that do not run when wet. Any time I've tried to use them like this they ran a rainbow of colors!! I haven't tried corn syrup . . . not sure if that will help, but I'll try it next! Good to know... I was wondering if syrup would work best... I bet chocolate syrup would bet tasty! eggwhite works wonders when getting those little things to stick onto the glass, can also be used with coloured sugars.